Spending time outdoors is one of our favorite family activity: we try to get out with our little explorer every day and do a small hike together every weekend. Our little explorer has turned 3 last August and our way of trekking and hiking is adapting to his needs. I already shared our tips for a successful hike with kids and would love to tell you a bit more about our favorite hiking spots in Italy. Let’s move out from the highlights of Dolomites and Cinque Terre to less known trails and discover our 3 top hikes for kids in Italy. Walking free on Veano boulevard, on the first hills near Piacenza. If you are visiting Milano and would like to escape the big city for a day out, consider driving to Piacenza hills. I love Bobbio and Val Trebbia where you can find a wild river to swim in the summer and an ancient town to explore in winter (here you have the post for a full itinerary in the Italian Caribbean). Today let’s do a detour driving up to the very first hills you can find on the Strada Statale 45: when you reach Ancarano turn left direction Veano and drive until you see a long boulevard heading up the hills. You can park the car along the main road and access the boulevard from the gravel road: there you can let the kids run free, have a picnic and do some tractor sightseeing (top activity for a toddler). The almost flat boulevard is approximately 2 km long and it’s a very easy walk for children of all ages. If you like the fall colors, it’s a perfect place to enjoy the foliage. Enjoying the fall colors in the countryside. You can continue your day out at the playground in Rivergaro on the Trebbia shores or drive until Bobbio to fully enjoy Val Trebbia. As you may know, my boyfriend’s family lives in Vittorio Veneto and we often spend our weekends and holidays there. It’s a very beautiful area full of hikes and trails of all kinds. All people visiting Vittorio Veneto have seen Sant’Augusta, the church nestled in the hills, and a lot of people living there walk along this trail at least once a week, some on a daily basis. The trail starts from Serravalle with stairs and continues in the woods on cobblestones. It’s a very pleasant walk also in the summer because it’s shuttered and not too steep. Don’t forget a kid-carrier because it’s anyway a 300m drop: to give you a rough idea my 3 years old toddler can walk about half way up, every time he’s walking a step more but it would be too much for him now to do the whole hike ups and downs. Family Portrait before the last steps at Sant’Augusta. Once you are arrived at Sant’Augusta, you can enjoy the view and if you are lucky on a clear day you can see the Adria sea. Take a rest and drink a coffee or a juice at the local Ristoro Sant’Augusta. You can go down the same way or take two different trails: with toddlers and children I would suggest taking the road going through the vineyards especially in winter because it’s in full sun. After descending the stairs you just have to walk straight on at the first chapel, the trail becomes an asphalt road but with very few cars. Sant’Augusta from the vineyard route. I have spent many summers working in a private hut in Resy on the Mount Rosa slopes and I am deeply in love with this place. There is only one way to arrive there at 2.066 m: on your feet hiking for 45 to 60 minutes on a steep trail partly in the woods. You have to hike 400m drop and you feel it. I would personally recommend booking a room in the hut and spend a whole weekend there so that you can fully enjoy the different hikes. Arriving at Rifugio Ferraro, Resy, Aosta Valley. If you have only one day, after reaching Resy you can turn left direction Pian di Verres to enjoy the view of the glacier and go on to Lago Blu, an alpine turquoise lake. Lago Blu, an alpine lake famous for its shades of blue and green. If the day is clear and you are used to longer hikes from Resy you can turn right and climb up Palon di Resy: this hike is not for everybody as you have to reach the summit at 2675m walking under the sun for most of the trail. The view is unbeatable and worth every effort you have done! At the hut Rifugio G.B. Ferraro you can have lunch or a snack and refill your bottle of water. 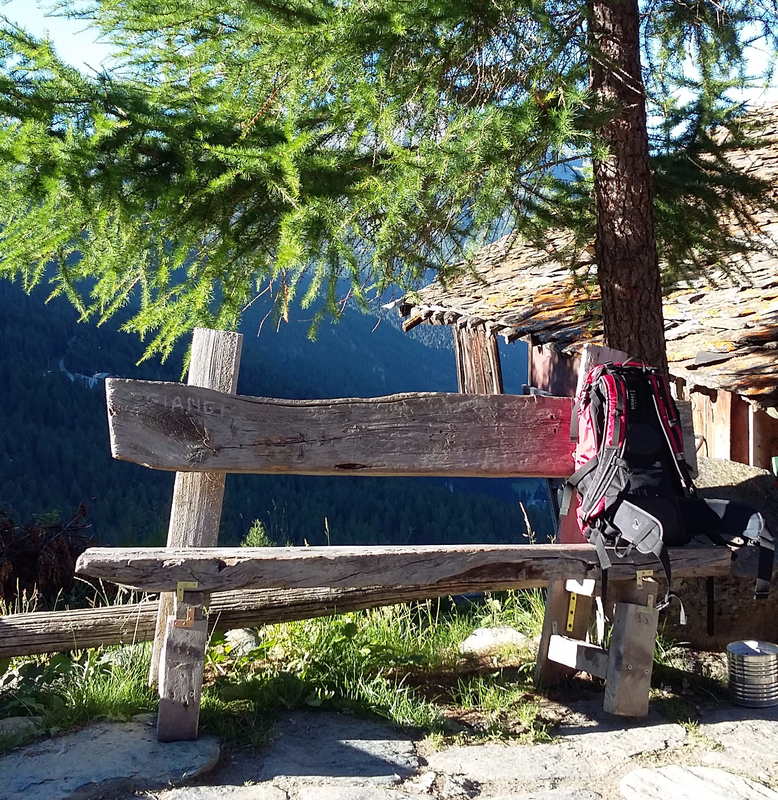 This hut is one of the stop along Alta Via n. 1 Trail. Grown up children and teens will enjoy the hut lifestyle and the amazing landscape. These are my suggestions to go hiking with kids of all ages in Italy and discover some hidden beauties. Do you have favorite hiking spots? Feel free to share them in the comments, I’d love to check them out and add them to my bucket list. Grazie mille! Con un bambino bisogna reinventare il proprio modo di viaggiare e per noi passare del tempo all’aria aperta significa trovare una meta adatta per tutti. Hi Sue, we love walking and spending time outdoors, it’s really our family top activity. To be honest I have not brought my little one to Rifugio Ferraro yet because it’s really a tough hike if you have to carry a kid on your back but I’d love to bring him as soon as he can fully enjoy it.